Donald Trump just hired David Bossie from the organization Citizens United onto his campaign team. Citizens United is best known for its 5-4 Supreme Court “free speech” victory in 2010, Citizens United v. FCC. In that opinion, Supreme Court Justices Anthony Kennedy, John Roberts, Antonin Scalia, Clarence Thomas, and Samuel Alito declared that money equals speech and that freedom of the press equals freedom of the corporation to spend unlimited money on buying campaigns. 1. In 1991, the advocacy group Citizens United was created for the purpose of campaigning to promote Clarence Thomas to the Supreme Court. He may have owed his narrow victory in the Senate vote (52-48) to this advocacy. 2. The organization Citizens United spent money on a public relations campaign to support the Clarence Thomas nomination to the Supreme Court. Clarence Thomas voted for the side of his benefactors at Citizens United in the Supreme Court case. There are no mandatory conflict-of-interest rules for the Supreme Court. 3. In 1998, David Bossie was forced to resign from a campaign funding investigation into the Bill Clinton administration for releasing misleadingly edited interview tapes. He went on to become the president of Citizens United. 4. Citizens United attempted to use FCC rules to block advertising of a movie. In 2004, Citizens United filed a complaint to the FCC against the Michael Moore commentary movie Fahrenheit 911 because promotions mentioned a candidate’s name (George W. Bush) too close to an election. The film was permitted to continue. 5. The object of the Citizens United case was Hillary Clinton. In 2008, Citizens United released its own “electioneering” movie, Hillary, The Movie. The movie was advertised close to an election under the FCC rule. This time, Citizens United found itself on the other side of the speech issue. 6. Immediately after Citizens United gave unlimited spending rights to corporations, appeals court case SpeechNow.org v. FEC logically followed and gave unlimited contribution rights to individuals. 7. The new electioneering entity created became known as the Super PAC. 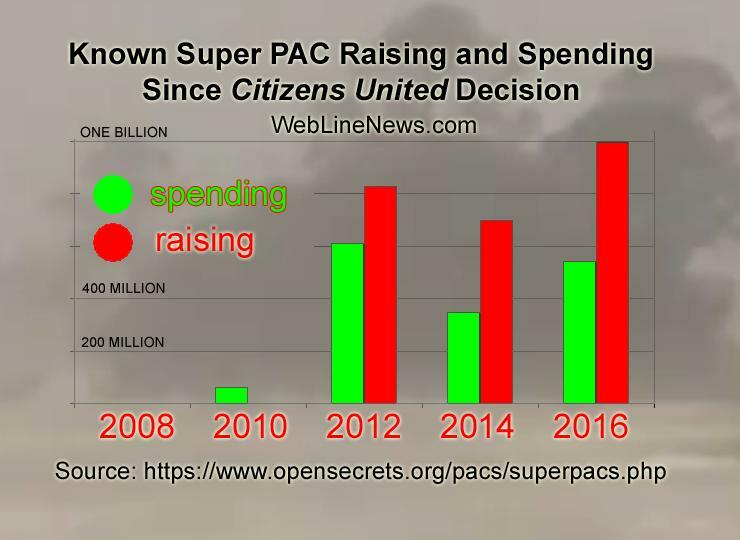 According to Open Secrets, Super PAC funding went from zero before the case to nearly a billion dollars so far this year just four federal election cycles later. 8. In subsequent decisions, the Supreme Court extended speech rights to spend unlimited money. In 2011, a 5-4 Court struck down public matching funds to be used by opponents of well-funded campaigns. In 2014, a 5-4 Court struck down some of the donation limits by individuals to campaigns or parties. 9. The Supreme Court drew a line at campaigns for judges. In a 2015 case, a 5-4 Court upheld a law preventing elected judges from directly soliciting campaign funds. However, judges may still have their campaigns ask directly for those funds, and judges may still review lists of the donors. The crossover Justice was John Roberts, who wrote the decision. With Donald Trump hiring the chief of Citizens United, his earlier comments opposing Super PACs as a “totally phony deal” will need revisiting.